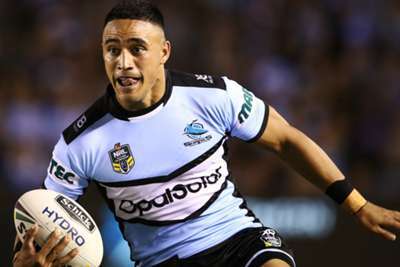 Valentine Holmes' hopes of playing in the NFL have been boosted after the former NRL star joined the New York Jets as part of the International Player Pathway Program. Trying to follow in the footsteps of fellow rugby league to NFL converts Jarryd Hayne and Jordan Mailata, Australian Holmes will compete for a spot on the 53-man roster through training camp. If the 23-year-old ex-Cronulla Sharks full-back does not make the cut via the Pathway program, Holmes will be eligible for an 11th spot practice squad exemption. However, he will not be allowed to play in 2019 if that is the case. "I'm speechless," Holmes said in a statement via Twitter following Monday's announcement. "Firstly I would like to thank the @nyjets for giving me the opportunity to join your organisation. "I'd like to thank my family, friends, fans, Chris and Gavin Orr from @pacific_sports for supporting me!" I’m speechless. I don’t know where to start. Firstly I would like to thank the @nyjets for giving me the opportunity to join your organisation. I’d like to thank my family, friends, fans, Chris and Gavin Orr from @pacific_sports for supporting me. !